Tetlow King Planning (TKP) helped Cougar (Chippenham) Ltd to secure full planning permission for a landmark office building and KFC drive-through at a prominent gateway to Chippenham. The site is on Methuen Park and is adjacent to the junction of the A4 and A350 on the western edge of Chippenham. Wiltshire Council North Area Planning Committee granted the application. Jonathan Adams, Director, co-ordinated pre-application negotiations with officers including planning, urban design and landscape officers, working with a wider team of specialist consultants including Frame International, Architects and Designers. The design changed several times including toning down the colours and materials to reflect local distinctiveness in Chippenham. The drive-through building will be unique through its use of local building materials. On approaching the site, the design and materials of the building means that it will be set against the back-drop of the landmark office building and will be subservient to it. Associated access off A350 and exit onto A4; car parking; landscaping. The proposal will deliver 230 jobs in Chippenham, which the Council identifies as a sustainable and priority location for employment. The applicant has received expressions of interest for all of the proposed floor space including two firms who want to create headquarters at the office building; well-known coffee operators who want to open at the ground floor of the office building; and KFC who will occupy the drive-through. This interest means that the proposal will generate jobs very quickly and at a time when employment opportunities are needed. Jonathan presented the proposal to Councillors at the Planning Committee meeting and made clear that the creation of so many jobs in Chippenham was an important material consideration in favour of the proposal. Although the subsequent appeal was dismissed, the Inspector made important observations about the design, character and appearance of the type of building that should be located at the site. The Inspector was critical of the proposed hotel, which he described as “mundane”. For this reason, the Inspector dismissed the appeal. Jonathan was successful in advising Councillors that the Inspector’s findings were important because any future building at the site must not be “bland and undistinguished” but must be a prominent, “landmark” building, which “is out of the ordinary”. With this in mind, the 4.5 storey office building is positioned close to the A4 and will face towards the roundabout junction. 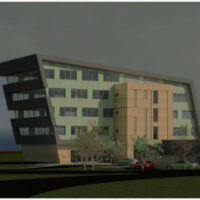 The building is a striking design and satisfies the Inspector’s desire for a well-designed landmark feature that will be highly prominent and visible when approaching Chippenham from the south and west.